The book the great days of the steam railways in the county. It shows how and why the lines were built, giving an account of the people who laid the lines and built the stations. The text explains how the steam railway system worked: the signals, the turntables, up and down platforms, taking on water, the carriages and engines. Also looked at are the people who worked on the railway: the engine drivers, the firemen, the signalmen, the porters, the ticket inspectors, the maintenance men, the cleaners and so forth. 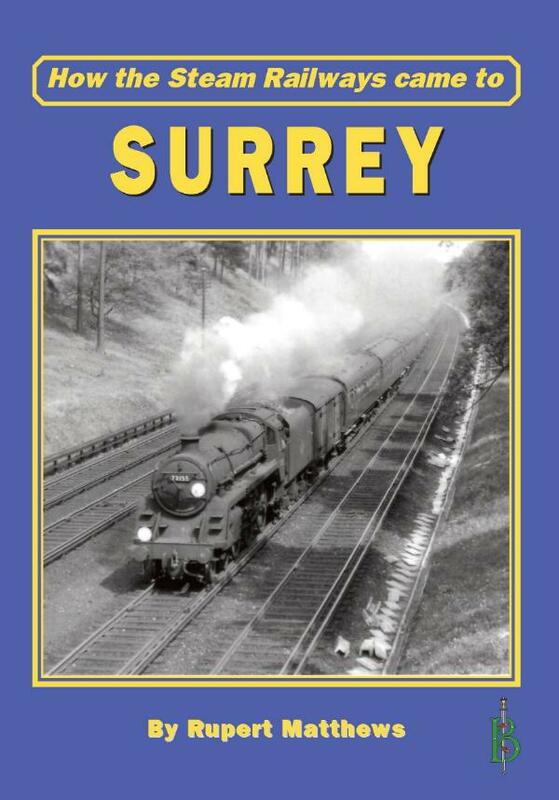 The book also deals with the ways in which the railway changed the people and landscapes of Surrey with excursions, population growth and changes, new industries and the decline of old trades. It is designed to appeal to a wide readership interested in the days of steam. The first steam railway to be built in Surrey was primarily a goods line which opened in 1839. This was the London and Croydon Railway, which ran from what is now London Bridge station to what is now West Croydon. This line is now entirely within Greater London. Much more difficult was the task of anticipating how many passengers might want to travel a particular route. Despite this it was a line built with passengers in mind that was the first to strike out across Surrey on a route from London to Brighton. The fact that part of the route ran through Surrey was merely coincidental. The idea was first suggested in 1825 when a group of businessmen formed a company called, rather optimistically, The Surrey, Sussex, Hampshire, Wiltshire and Somerset Railway. They employed the famous bridge architect John Rennie to survey what they intended to be the first route of an extensive network, that ran from London to Brighton. No sooner had he begun work than the plan was dropped. Four years later Rennie was hired again, this time to survey two different routes. The first was to take in the intermediate towns of Dorking, Horsham and Shoreham, while the second was to run direct between London and Brighton. This time he completed his work, but the company foundered due to a lack of funds and interest. In 1835 the London and Brighton Railway (L&BR) was founded and bought up Rennie’s work. This new company favoured the direct route, but the matter had to go before a Parliamentary committee, which took months to pore over the various options before finally deciding that the L&BR had been right all along. Rennie’s direct route was therefore adopted, even though it would involve the building of several expensive tunnels and bridges that could have been avoided on the longer route. As with the earlier horse-drawn iron roads, the new railways required an Act of Parliament to compel landowners to sell, gain the right for the railway to cross rivers and other legal matters. The L&BR act was passed by Parliament in July 1837, but the MPs had introduced some variations. The railway was not to have its own London station, but to use that of the already existing London and Croydon Railway. The line would begin at Norwood and then follow the Rennie direct route, with branch lines authorised to Lewes and Shoreham. The MPs also introduced an amendment that the L&BR had opposed. The Members of Parliament were at the same time considering a proposal to link London to Dover and Folkestone put forward by the South Eastern Railway (SER). For some reason the parliamentarians felt that there would not be enough trains coming into London to justify the bother of having two lines. They therefore stipulated that the SER and L&BR should share a line from Norwood south through the North Downs. The two railway companies would have their own lines only after that. In the House of Lords, the railway found itself confronted by the influential Lord Monson. Monson had nothing against railways, in fact he was generally in favour of them. However, the proposed route would run very close to his home at Gatton Hall, southwest of Merstham. The house stood on a south facing slope looking across a shallow valley in which had been constructed an artificial lake to improve the view. And the railway route would be on the far side of the lake and in full view of the house. In order to mollify any objections that Lord Monson might have to this, the railway placed Merstham Station immediately outside the gates of Gatton Hall on Battlebridge Lane, almost a mile away from Merstham itself. The villagers were able to watch the trains passing within 50 yards of their homes, but had to face a lengthy walk to get on the things. Such considerations would bedevil the building of the railways across Surrey and lead to some decidedly odd situations. At least in Merstham’s case the situation was later sorted out when the station was moved to its present location in the village centre. Despite these problems, construction began in 1838 under the guidance of engineer John Urpeth Rastrick. At the height of the works, in the summer of 1840, Rastrick had 6,206 men, 962 horses, five locomotives and seven stationary engines under his control. The building of this line was Surrey’s first introduction to railway building, railwaymen and to railways in general. It was not an altogether happy experience. Because of the need to keep the track as level as possible, the route through the North Downs called for a deal of major engineering works. The most important of these was the tunnel between Coulsdon and Merstham. The tunnel was 1 mile 253 yards long, with an extensive cutting over 100 feet deep leading into its northern end. The chalk excavated from the cutting and tunnel were used to build embankments that served to flatten out the slope up to the tunnel entrance. The tunnelling through the Downs was hampered by the fact that the hills were pocked by old mine workings. One of these old tunnels had filled up with water and when the railway workers broke through a flood followed. One man was killed and large quantities of equipment destroyed. The building work meant that, for the first time, Surrey was the temporary home to large numbers of navvies — 6,000 of them in all. These navvies, or workmen, were a distinguishing feature of the railway construction period. Without them there could have been no railways, yet they were a constant source of trouble and frustration. The word “navvy” is derived from “navigators” and referred to the days when gangs of workmen moved about the country building canals, or inland navigation waterways. At this date there were no mechanical diggers, bulldozers or trucks. Everything had to be done by hand or by horse power. The navvies were equipped with picks and shovels to do the digging, and had horse-drawn carts to haul the rubble away from the site. The amount of muscle power needed to dig a cutting 100 feet deep through solid chalk was enormous, which was why so many men were employed on this and other railway projects. By the nature of the job, the men moved about constantly. As each rail line progressed they moved along with it, in the case of the LB&SCR/SER line they started just outside London and moved slowly south over the passing months. And when one railway line was finished they had to move right across the country to start work on the next one. They lived in temporary wooden shacks, little more than sheds that were dismantled and moved on as the worksite moved. It was no life for a family man, so nearly all navvies were unmarried young men who came to work the railways for a few years to earn money before returning home to settle down, or finding some less physically arduous job. At this date, most navvies were Englishmen with the majority coming from economically depressed areas — such as Surrey. Inevitably, with huge numbers of young men encamped together things could sometimes turn a bit rough. The most reliably difficult day was Saturday, when the men were paid. Thirsts were great among the navvies and huge quantities of beer could be consumed. This led to frayed tempers, imagined slights and frequent recourse to fisticuffs among the men. When efforts were made to limit the amount of beer available on a Saturday evening a strike followed. Generally the works in Surrey passed off without any serious incident — largely due to the fact that the route did not pass through any major towns. The navvies were not, therefore, tempted to pour into a town to drink the pubs dry and get into altercations with locals as happened elsewhere. In an attempt to curb disputes with locals, the railway building contractors took to providing everything the men would want. This process was still in its infancy as the LB&SCR/SER lines were built, but would later give rise to some highly sophisticated organisations. The company provided cookhouses where three meals a day were served. These meals were paid for with tokens which the navvies were given in place of some of their cash wages. The navvies could also arrange for part of their pay to be held back and either sent to their families or invested in a bank. The idea was to encourage the men to use their wages wisely, saving for the future or helping their kith and kin instead of spending it all in the local pub.